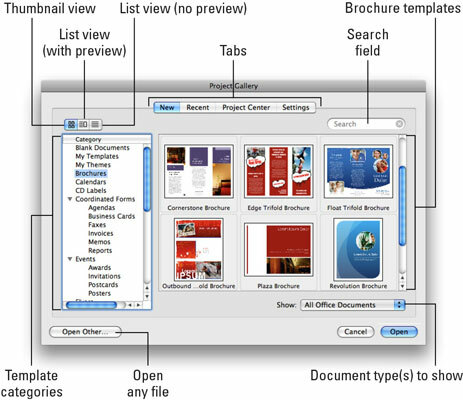 The Project Gallery in Office 2008 for Mac is a useful, multipurpose dialog available in all Office applications that makes working with your documents easier. If the Project Gallery doesn’t appear automatically when you launch one of the Office applications, choose File→Project Gallery or press Command+Shift+P to open it. If you want the Project Gallery to always open automatically when you launch one of the Office applications, open the application’s Preferences dialog and select the Show Project Gallery at Startup check box. The New tab lets you start a new document by choosing a template or blank document. The Recent tab lets you open a recently used file. The Project Center tab lets you open a file you’ve linked to a project. The Settings tab contains preferences for you to set for the Project Gallery itself. View buttons: The three view buttons — Thumbnail, List view (with Preview), and List view (without Preview) — change the way the files in the right pane (Brochure templates, in the figure) are displayed. Recent tab: Displays a list of documents you’ve used recently. You can choose the number of documents it remembers in the Settings tab. Project Center tab: Displays a list of your projects. Click a project, and its associated files are displayed in the right pane. Settings tab: Lets you set preferences for the Project Gallery’s behavior. Search field: Type a word or words here to find files that contain that word or words. A search is limited to the current tab. If you want to search for a file associated with a project, you have to click the Project Center tab before you begin typing your search term(s). Templates: The right pane in the Project Gallery displays the available items, based on the category you select in the left pane. In the figure, that category is Brochures, so the items in this pane are Brochure templates. To open an item, you can select the item by clicking it and then clicking the Open button. But simply double-clicking the item is faster and easier. Document Types to Show pop-up menu: This menu lets you limit each tab to Word, Excel, PowerPoint, or Entourage documents, or not limit them by choosing All Office Documents. Open any file: Closes the Project Gallery and opens a standard Mac OS X Open File dialog. Template categories: Click a category in the left pane to display files of that type in the right pane.